WASHINGTON (CNN) -- The Senate Judiciary Committee on Tuesday delayed its confirmation vote for Judge Sonia Sotomayor by one week, acceding to GOP demands for more time to examine the U.S. Supreme Court nominee's record. 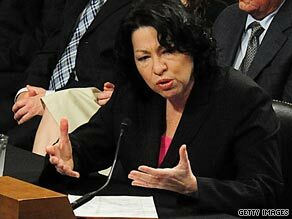 Judge Sonia Sotomayor answers questions from senators during confirmation hearings last week. "We all know that Judge Sotomayor will be confirmed," said the panel's chairman, Sen. Patrick Leahy, D-Vermont. "Once she is passed in this committee, there will be no delay on the floor." The White House and congressional Democrats have expressed confidence that a final floor vote on Sotomayor will occur before the early August Senate recess, leaving her with sufficient time to prepare for the high court's next oral arguments September 9. Sen. Susan Collins, R-Maine, voiced her support for the 55-year-old federal appeals court judge, joining three GOP colleagues who earlier said they would vote for the nominee. "I have concluded that Judge Sotomayor understands the proper role of a judge and is committed to applying the law impartially without bias or favoritism," Collins said in a statement. Republican Sens. Richard Lugar of Indiana, Olympia Snowe of Maine and Mel Martinez of Florida have said they would back Sotomayor. Also announcing support for Sotomayor is the abortion rights group NARAL Pro-Choice America. Sotomayor has not confronted a case dealing directly with abortion rights in her 11 years as an apellate judge, but NARAL said it was convinced she would uphold the legacy of Roe v. Wade, the 1973 high court ruling legalizing abortion. "We are pleased that Judge Sotomayor expressed stronger support for the established constitutional right to privacy than either Chief Justice [John] Roberts or Justice [Samuel] Alito, both of whom had anti-choice records before being nominated to their current positions," a statement from the group said. "She also articulated several times throughout the hearing that the constitutional right to privacy includes the right to choose." President Bush nominated Roberts and Alito to the Supreme Court in 2005. Sen. John Thune, R-South Dakota, announced he would vote against Sotomayor, who completed three days of testimony last week before the Judiciary Committee. CNN Supreme Court producer Bill Mears contributed to this report.